Try the new version here: Download. We’re having a second run at Bits du jour today, so you can get the ReplyButler Business Edition for an amazing $19,99! Check their website for the details. If you haven’t checked out ReplyButler you can do so here. It’s our “Outlook help-desk plugin with integrated multi-language text module management and automatic name answering”. Yes, a new Butler is here. No new features this time, but some minor improvements and bug fixes. No big thing, but worth the update. Get it here. Do you keep the e-mails you answered? Probably. Do you keep them well organized? Probably not. With ReplyButler that’s easy, because it’s done automatically. The program can automatically move and e-mail that you answered into the right folder. The customer is talking about “Product A”? Simply defined a rule for the products name and ReplyButler will move any e-mail where that product is mentioned in subject and / or mail body. ReplyButler can move the original e-mail, or also your answer (after it’s been sent) – whatever you like. Try it, I promise that you won’t want to miss it any more! Especially when you’ve got duplicate contacts, it can happen that the contacts are not quite the same, but similar. Now what can you do about this? Deleting simply one version probably isn’t what you want. With 1-Click duplicate for Outlook it’s easy by default. Simply run the scan in the 1-click mode and the program will merge the contacts. Meaning: If the items are the same, it’s fine. If some items are different, they’ll be assigned both value. The new one and in brackets the old one. This way, you still have both values (in case that you still need the old phone number, for example). 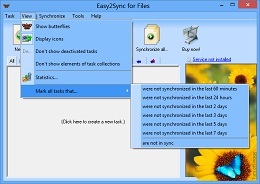 Easy2Sync for Files can exclude files from synchronization depending on positive and negative lists. These lists are very powerful, but if you don’t know how to handle them, you can also make powerful mistakes. A typical mistake is to expect intelligence from the software when applying your rules (especially if you’re using positive lists). Easy2Sync exactly follows your rules but it can’t ‘understand’ them. Often, you’ll man to synchronize a certain directory. This is normally configured corrected. But your rules may disallow the synchronization of the directory above. Result: Easy2Sync encounters the directory above and notices that the directory above may not be synchronized according to the rules. And thus it ignores the entire sub-tree, including the subdirectory for which you specified special rules. At first Easy2Sync was developed just to synchronize. Now you can also just copy or overwrite data. When synchronising, both computers have the same rights. Changes on one computer will be transferred to the other. In a sub-dialog of the first page of the task properties you can choose other modes. In the copy mode, one computer is the slave (the target computer) and only receives the changes (of the source computer). If you change something on the target computer, Easy2Sync will undo this and delete your changes. Changes on the source computer however, will be copied to the target computer. Overwriting is the same as copying, with one difference: In the overwrite mode Easy2sync will never ever delete any files. Even if you delete a file on the source computer, it will not be deleted on the target computer. Moving is also quite similar to copying. With one difference: The file will be deleted from the source PC after copying it to the target PC. You can choose whether you want to move both files and directories or move only files and keep the directory structure on the source PC. To flatten the structure means that the files aren’t simply copied from the source to the target PC, but the directory information will be lost. No matter in which subdirectory of the source PC the file was stored, but will be copied directly into the target directory (and not in any subdirectory). Just like a Copying mode this task type always works in the specified direction. If several files with the same name exist in different source directories, the newest one will win the conflict in the long run (maybe only after several synchronizations). You can download the demo version here and the registered version here. If you have many tasks, it’s time to get organized. If you haven’t already done so. Use the task collections to group several synchronization tasks into one task collection. And then enable the filter “Don’t show elements of task groups” in the view menu. And suddenly your file / e-mail synch became a lot easier. You’re seeing much less tasks now (don’t worry, they’re still there), but you can run all of them in one go with the task collection. Easy2Sync can synchronize both your e-mails and your calendar items. This can be useful if you want to share your calendar with you co-workers. But what about your private data in your calendar? That’s none of you co-workers’ business. No problem with Easy2Sync for Outlook – you can simple exclude private items from the PST sync. Simply active the “private filter” in your task properties. It also works the other way round. You can synchronize (or copy) only your private items, if you’d prefer that, for example for your private calendar at home. Download it now and try it.